Photo on top left: Professors Carol Clark (standing, left) and Janet Bauer (standing, right) lead a presentation to International Hartford leaders of student research on city’s immigrant population. Photo on top right: Students who researched the city’s immigrant community by canvassing ethnic shops, interviewing proprietors and patrons, listen to findings. The last 2 photos are clients with their products: Sarah with her delicious treats, and Amy, the grinning baker, with cookies and squares. In Connecticut, there is no doubt that immigrant entrepreneurs and innovators play an important role. Immigrant entrepreneurs bring in additional revenue, create jobs, and contribute significantly to the state’s economy. Highly skilled immigrants are vital to the state’s innovation industries and to the metropolitan areas within the state, helping to boost local economies. Furthermore, local government, business, and non-profit leaders recognize the importance of immigrants in their communities and support immigration through local “welcoming” and integration initiatives. Immigrant entrepreneurs contribute significantly to Connecticut’s economy. 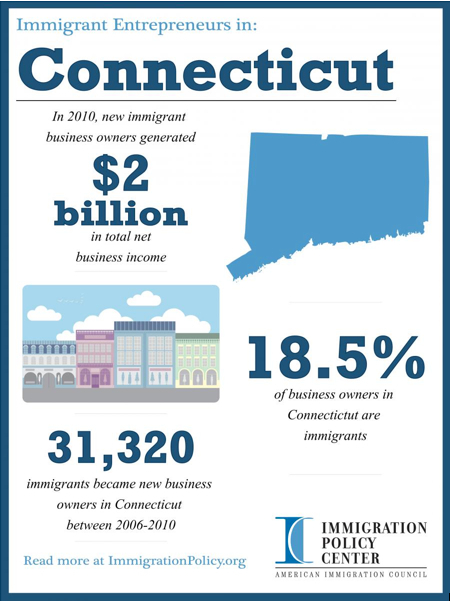 From 2006 to 2010, there were 31,320 new immigrant business owners in Connecticut and in 2010, 18.5 percent of all business owners in Connecticut were foreign-born. In 2010, new immigrant business owners had a total net business income of $2 billion, which is 15 percent of all net business income in the state. Connecticut is home to many successful companies with at least one founder who was an immigrant or child of an immigrant, including United Technologies Corporation, Pitney Bowes, General Electric, and Terex. Those four companies together employ over 550,600 people and bring in over $217 billion in revenue each year. Highly skilled immigrants are vital to Connecticut’s innovation industries, which in turn helps lead American innovation and creates jobs. Immigrants contribute to Connecticut’s economic growth and competitiveness by earning degrees in science, technology, engineering, and mathematics (STEM) fields from the state’s research universities. In 2009, around 38 percent of STEM graduates earning masters or PhD degrees from these universities were foreign-born, and 68 percent of graduates earning PhDs in engineering in Connecticut were not born in the U.S. In 2011, the U.S. Department of Labor certified 5,271 H-1B high-skilled visa labor certification applications in Connecticut, with an average annual wage of $72,199, which is within range of Connecticut’s median household income of $69,519, but higher than its per capita income of $37,807. An expansion of the high-skilled visa program would create an estimated 6,600 new jobs in Connecticut by 2020. By 2045, this expansion would add around $2.2 billion to Gross State Product and increase personal income by more than $2 billion. The following are examples of metropolitan area demand for high-skilled foreign-born workers. The Hartford-West Hartford-East Hartford metropolitan area had 1,761 H-1B visa requests in 2010-2011, with 74.5 percent of H-1B visa-holders working in STEM occupations. Major employers with a need for H-1B high-skilled workers include the University of Connecticut, Larsen & Toubro Infotech Limited, Cognizant Technology Solutions, Infosays Technologies Limited, and Sagarsoft Inc. Immigrant entrepreneurs not only contribute to large innovative companies, but also to small businesses in local communities. In cities across Connecticut, immigrant family-owned small businesses contribute to the vitality of their local communities. Although initially aimed at other immigrant customers, many businesses quickly see an expansion of their clientele to include a diverse array of immigrant and native-born customers alike. In Hartford, Connecticut’s capital city, immigrants have been starting businesses since the city’s founding. From taco truck owners, to Asian grocers, to barbers from Bosnia, immigrant entrepreneurs and small business owners are helping to spark a revival in Hartford. Hartford’s Park Street neighborhood, an approximately two-mile retail corridor running from Main Street to Prospect Avenue, contains a mix of restaurants, bodegas, clothing boutiques, grocery stores, jewelry stores, and other retail and service providers, many of which are immigrant-owned and operated. Luis Diaz, from Guatemala, opened Ortega’s Restaurant in downtown Danbury in 2012. Diaz says his restaurant specializes in many types of food to cater to Danbury’s diverse population. “We want to try to attract different people, like Americans, Spanish[-speaking] people, all different cultures. We have a little mix of everything,” he said. In Connecticut, localities have begun recognizing and supporting immigration through “welcoming” and integration initiatives. The program provides services such as English and citizenship classes, resources for studying, and assistance with accessing immigration information. The Cultural Navigators program recruits and trains volunteers to mentor and tutor newcomers. 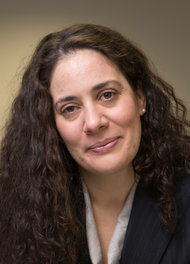 The White House recognized the work of The American Place by honoring its director, Homa Naficy, who herself is an immigrant from Iran, as a White House Champion of Change in June of 2013. The recognition spotlights the positive work Naficy and her initiative are doing for immigrant integration in the Hartford community. 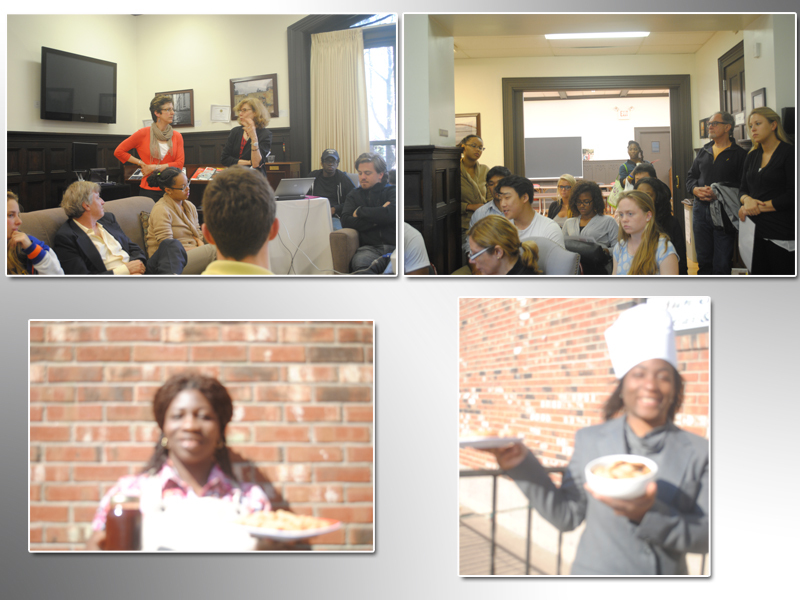 International Hartford, formed in 2013, exists to support immigrant-owned businesses. 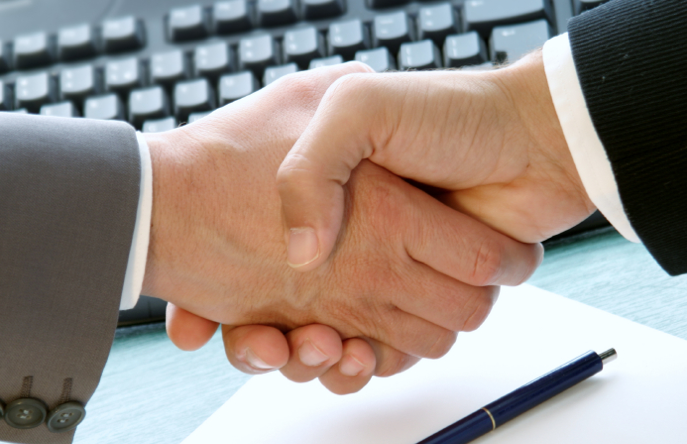 Specifically, the organization assists immigrants, refugees, and their children start and expand businesses. International Hartford helps potential immigrant entrepreneurs overcome barriers to starting a business. Milagros S. Cruz, Chair of the International Hartford board, notes that the organization strives to partner with immigrants wanting to start a business, help new and existing entrepreneurs navigate red tape, determine best ways to access credit, as well as other services. In an effort to improve its approach to immigrants, the City of Amsterdam sent a representative to New York City this year to do some field work. She landed in Mayor Michael R. Bloomberg’s Office of Immigrant Affairs, shadowing its staff for six weeks and taking notes. Officials from Philadelphia, with questions about diversity and integration on their minds, also reached out to New York City. They, too, wanted to refine their approach to their city’s fast-growing foreign-born population. New York’s commissioner of immigrant affairs, Fatima Shama, met with several top officials in Philadelphia, briefing them on her office’s work. In March, Philadelphia’s mayor opened his own Office of Immigrant and Multicultural Affairs. “Looking at the work that New York has done has become very important in figuring out how deeply we can get into really affecting the lives of immigrants, refugees and other underrepresented groups,” said Jennifer I. Rodriguez, executive director of the Philadelphia office. In the past few years, New York’s Office of Immigrant Affairs has become a prime resource — even a model — for cities around the world seeking to better accommodate and serve their increasingly diverse populations. Ms. Shama and her staff have provided direct assistance to more than 20 cities in the United States and abroad — including Baltimore, Boston, Chicago and Los Angeles as well as Florence and Turin in Italy — and at least 10 eventually set up their own immigrant affairs offices. “These are folks who said, ‘We have changing demographics in our respective cities and we need to get ahead of it, and if anyone can show us how to do it, it’s New York,’ ” Ms. Shama said. As efforts by the Obama administration to pass comprehensive immigration reform have faltered, states and municipalities have sought to deal with immigration-related challenges on their own. Some governments have toughened local enforcement measures against people in the country illegally, while others have opened the door wider to their foreign-born residents, providing more support and access to public services. During a succession of mayoral administrations, New York City has established itself as one of the most immigrant-friendly places in the nation. From the start of his tenure, Mr. Bloomberg proclaimed his support for immigrants, frequently extolling their contributions to the city and making it clear that regardless of immigration status, they were welcome. Among his signature immigration initiatives were executive orders that allowed all immigrants to access city services and report crimes without fear of being questioned about their status. Ms. Shama, who was born and raised in the Bronx, was appointed in 2009. Her approach to the job, she said, was informed by her experiences growing up as the daughter of a Palestinian immigrant father and a Brazilian immigrant mother. She remembers how some people mistreated her parents because of the way they spoke and dressed. The office’s mandate is to serve as a bridge — “the connective tissue,” Ms. Shama called it — between the immigrant population and city government, providing policy analysis and recommendations to the mayor as well as improving immigrants’ access to city services. Over the past several years, the office has begun and supported a range of initiatives meant to empower immigrant communities. They include educational campaigns to combat immigration fraud and improve health care access, coordinating city agencies in providing assistance to young immigrants applying for a federal deportation deferral program, encouraging immigrants to participate in English-language programs and become more involved in their children’s schools, improving financial literacy and college readiness, supporting immigrant businesses and training new leaders in immigrant neighborhoods. Some immigrants’ advocates said the office could have been more effective had it been given a bigger budget, a larger staff and control over more programs. Chung-Wha Hong, who recently stepped down as the executive director of the New York Immigration Coalition, said the mayoral transition provided an opportunity to sharpen the mandate and objectives of the office. Other immigrant leaders said Ms. Shama’s office did not champion their causes as ardently as they would have liked. While commending Ms. Shama and the mayor for their support of an Islamic community center planned for Lower Manhattan, Muslim leaders said the administration mishandled two other key issues: an effort to add Muslim holidays to the public school calendar, which Mr. Bloomberg blocked; and the Police Department’s surveillance of mosques and Muslim community groups in the city and elsewhere. Ms. Shama adopted a highly diplomatic posture on these issues, carefully acknowledging the community’s concerns while also supporting Mr. Bloomberg and the administration. “On two very important issues, we were very definitely left out in the cold,” said Linda Sarsour, executive director of the Arab American Association of New York. But others said Ms. Shama did some of her most effective work behind the scenes, advising and cajoling her colleagues and sensitizing them to the needs of the city’s foreign-born population. Whatever the impact of the office on the city’s immigrants, one of the most enduring legacies of her tenure may well be its influence elsewhere. Ms. Shama’s team in April published a set of documents known as Blueprints for Immigrant Integration. They lay out her office’s strategy for connecting with and serving the city’s immigrant population. More than 50 cities around the world, she said, are now using the blueprints to guide their work. Immigrants start businesses at a higher rate than non-immigrants, according to a Small Business Administration study. New businesses mean more jobs and economic activity.So, concluded Art Feltman and Milagros Cruz, why not help more immigrants start businesses? 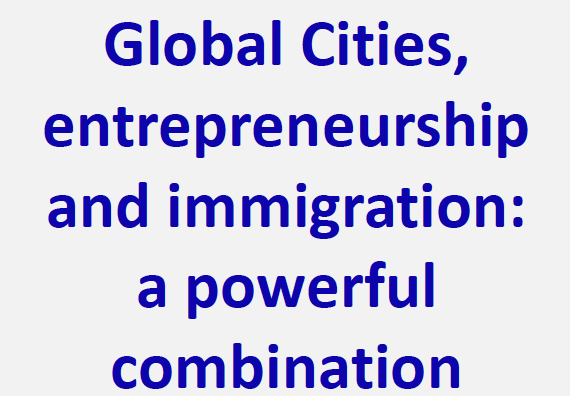 Mr. Feltman, a former Hartford city council member and state legislator, and Ms. Cruz, an immigration lawyer, have launched an entity called International Hartford, dedicated to helping immigrant entrepreneurs launch small businesses. It is not a lending institution, but rather a kind of clearinghouse that provides such supports as help with business plans, matchups with same-culture business counselors, market research and referrals to lenders. It’s a great idea, one that can promote commerce downtown and in the neighborhoods, where business is dearly needed. 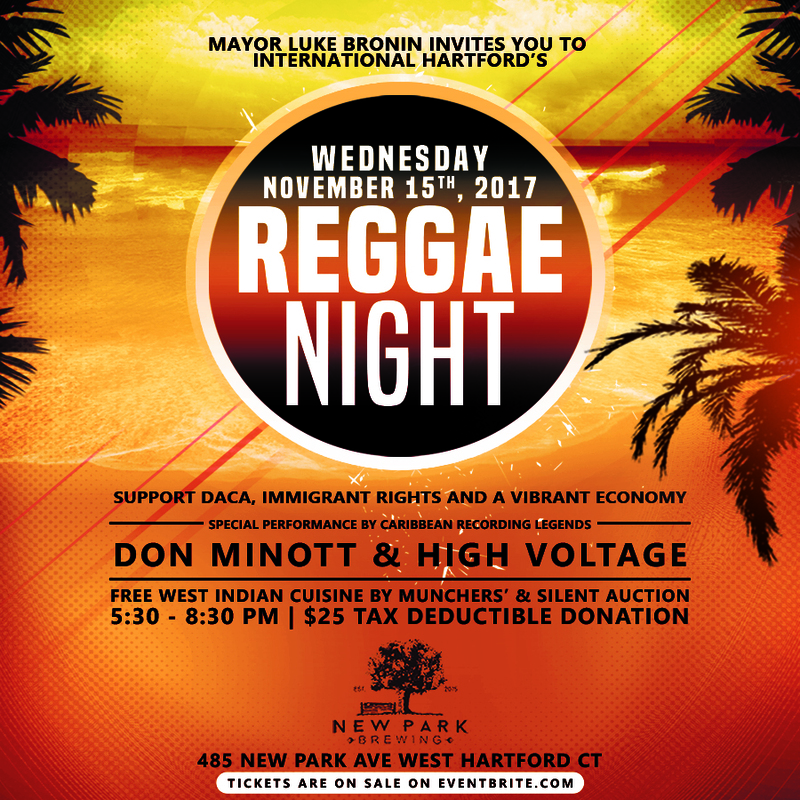 And if it builds on itself, if Hartford gets a reputation as a place that is friendly to immigrant businesses, who knows? The entrepreneur with a taco truck may smooth the path for a niece or nephew who starts a software company. An entrepreneur in Hartford might open trade with his or her home country. Immigrants have been starting businesses in Hartford since the city was founded. Many of today’s immigrants, unlike some periods in history, are well educated; about a third have college or graduate degrees. Some are underemployed and itching to move up the ladder. About a fourth of new tech companies have at least one founder born abroad, according to studies by the Kauffman Foundation, and the numbers are higher in the Silicon Valley. There’s no reason a little of that magic couldn’t happen here. DAYTON, Ohio — Fighting back from the ravages of industrial decline, this city adopted a novel plan two years ago to revive its economy and its spirits: become a magnet for immigrants. Other struggling cities are trying to restart growth by luring enterprising immigrants, both highly skilled workers and low-wage laborers. In the Midwest, similar initiatives have begun in Chicago, Cleveland, Columbus, Indianapolis, St. Louis and Lansing, Mich., as well as Detroit, as it strives to rise out of bankruptcy. In June, officials from those cities and others met in Detroit to start a common network. The new welcome for immigrants reflects a broader shift in public opinion, polls show, as the country leaves behind the worst of the recession. More Americans agree that immigrants, even some in the country illegally, can help the economy, giving impetus to Congressional efforts to overhaul an immigration system that many say is broken. The momentum for change in Dayton came from the immigrants. In 2010, Mr. Shakhbandarov told the newly elected mayor, Gary Leitzell, that he was thinking of asking Turkish immigrants across the United States to settle here. Most of the Turks in Dayton are refugees who fled persecution in Russia and other former Soviet bloc countries. Officials quickly realized that this city of 141,000 already had a small but fast-growing foreign-born population: more than 10,000 Muslims from different countries; refugees from Burundi and Somalia; college students from China, India and Saudi Arabia; Filipinos in health care jobs; and laborers from Latin America, many here illegally. The officials hosted many town meetings to test whether Dayton’s residents were ready to be hospitable. But the only vocal resistance came from anti-illegal-immigrant groups from other Ohio cities. In October 2011, the City Commission voted unanimously for the Welcome Dayton plan. A new group dedicated to helping immigrant entrepreneurs launch small businesses is banking on the notion. International Hartford aims to become a clearinghouse for immigrant merchants, providing them with information and resources to realize their dreams–and revive Connecticut’s struggling capitol city in the process. But in recent years, city and state leaders emphasized massive and expensive economic revitalization projects, such as Adriaen’s Landing, over smaller scale neighborhood-level businesses. 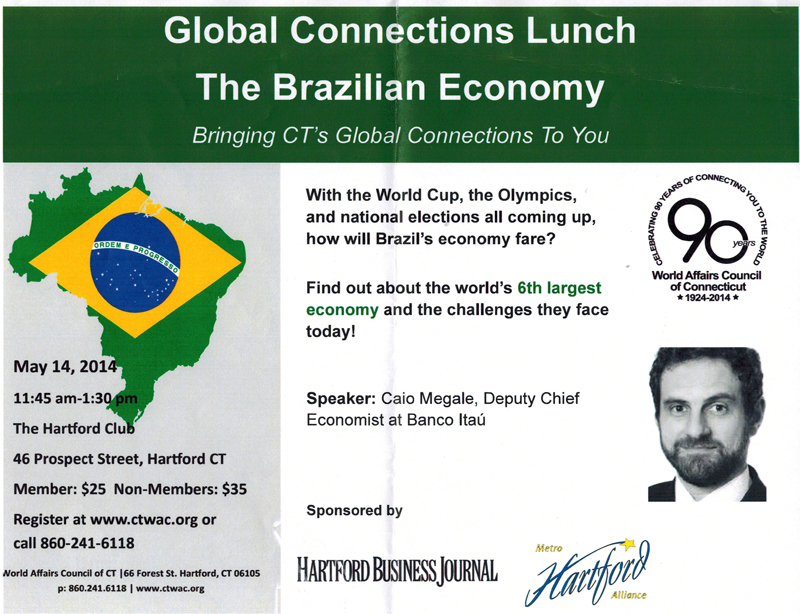 Art Feltman, the executive director of International Hartford, dubbed them “big bang” developments. International Hartford is not an immigrants’ rights advocacy organization. It also is not an investment group making micro-loans to immigrant-owned businesses. Instead, it will act more as a clearinghouse, or a “cultural broker,” in Feltman’s words, by providing would-be entrepreneurs the resources they need to kickstart their dreams. Secretary of the State Denise Merrill, who office oversees corporate filings, said she does not know how many of the state’s roughly 350,000 businesses are immigrant-owned. “We are trying to start much more data-collection…I want to know a lot more about who those businesses are,” she said. Merrill recalled her own grandparents, who came to the U.S. from Ireland and, like many immigrants, they opened a business. “Americans instinctively believe this is a land of opportunity,” she said. People who immigrate to the United States are twice as likely as native born Americans to start their own businesses. A new organization in Hartford says that entrepreneurial spirit needs to be fostered to help the city’s economy. Merrill said her office, which registers all businesses in the state, is looking forward to the connections this new organization can provide, and the data it may generate about just how immigrant businesses affect our economy. Some of those numbers may also challenge stereotypes — for instance, a quarter of all high tech firms in the U.S. are owned by immigrants.